On 11th June, 2018, the ‘Update multi-vehicle’ feature for E-way bill was enabled bringing in the much-needed declaration tool to reduce the efforts of many transporters. This option is available at the place of transhipment and not from supplier’s place. It is used to update for moving a single consignment in multiple vehicles from transhipment place. Earlier, separate delivery challans had to be raised first for consignment moving in multiple-vehicles, followed by generation of separate E-way bills for the same. 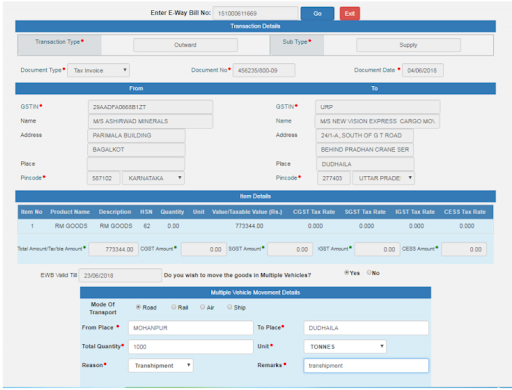 Now, using the multi-vehicle updation, the multiple conveyance details can be filled in after generating the E-way bill. Let us consider an example of sending goods from Karnataka to Sikkim whereby goods are being sent by rail to West Bengal and from there it is being transported by road. West Bengal will be the place of transhipment. From there, the goods are being moved in multiple lorries to reach the ultimate destination which is in Sikkim (considering that the ultimate destination is not connected by rail). In the earlier scenario, a single invoice would be issued and if at all they had to be sent in different vehicles, multiple delivery challans had to be raised. For each delivery challan, a new E-way bill had to be generated. But as per the changes enabled, as soon as the goods reach West Bengal, the same E-way bill can be updated with the vehicle details of the lorries that will be transporting the goods to Sikkim. A standard E-way bill has to be generated from the first transaction and then the same should be updated at West Bengal. The E-way bill can be generated on the common portal. Note that if goods were to be transported in just a single lorry in the above case, the Part-B of the same e-way bill had to be updated with a different mode of transport due to the reason of transhipment. In a widely prevalent transporter used case, the supplier sends goods to the warehouse of the transporter. From the warehouse, the goods are sent to different destinations through multiple vehicles(Distribution chain). 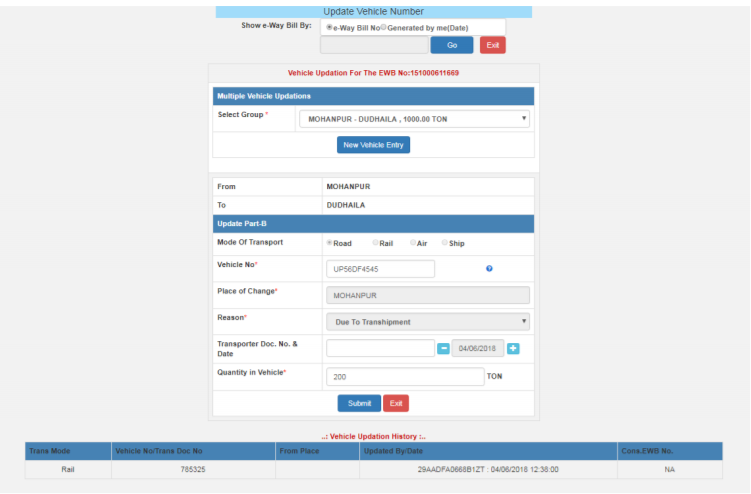 In the above example, when the vehicle reaches the warehouse, the remaining vehicle details should be updated in the E-way bill. We have 3 vehicles moving from warehouse to destination A, 2 vehicles to destination B and C respectively. Step 1- Go to Menu and select ‘Change to multiple E-way bill’ option. 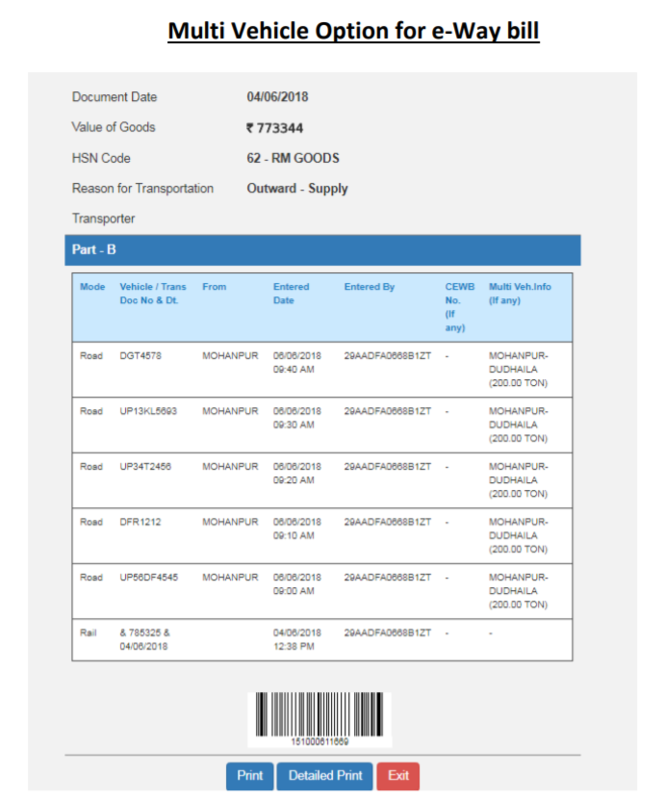 Enter E-way bill number for which multiple vehicle details is required and click ‘Go’. Step 2: In this section, create group to enter details of transportation- destination and select mode whether is by road, rail, air or ship. Multiple Vehicle Movement Details box appears as given below. We have to key in ‘From’ and ‘To’ place, total quantity (matching the quantity as per Invoice), reason (reason for entering multiple vehicle details could be given, like moving the goods in a different or a smaller mode of transportation etc.) and enter remarks to create a Group for updating the multiple transport details for the E-way bill. Details in ‘From’ section for case 1 will be West Bengal and for case 2 will be the place of the warehouse. Details in ‘To’ section for case 1 will be Sikkim and for case 2 will be A, B and C respectively. Click on ‘Go’ after entering the E-way bill number after which, the groups created will be shown in the drop-down options. From these options, groups have to be selected and vehicle details have to be updated. After following the above steps and submitting the details, the groups created will be saved. Once the goods reach the place of transhipment, and vehicle details have to be updated for each of the groups created. 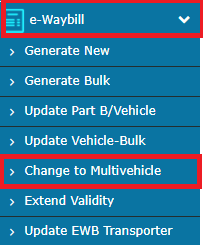 Step 3: After creating the group under Step-2, Part-B must be updated under ‘Change to multiple vehicle’ option. In this step, the group that was created earlier must be updated with the different destination groups. If there are multiple destinations (like in case study 2) we have to select the respective group & update Part-B & repeat the process for the remaining groups. After selecting the group, the vehicle details have to be updated in Part-B for all selections made. Additionally, transporter document number, as well as the quantity to be transported in that vehicle, have to be keyed in. 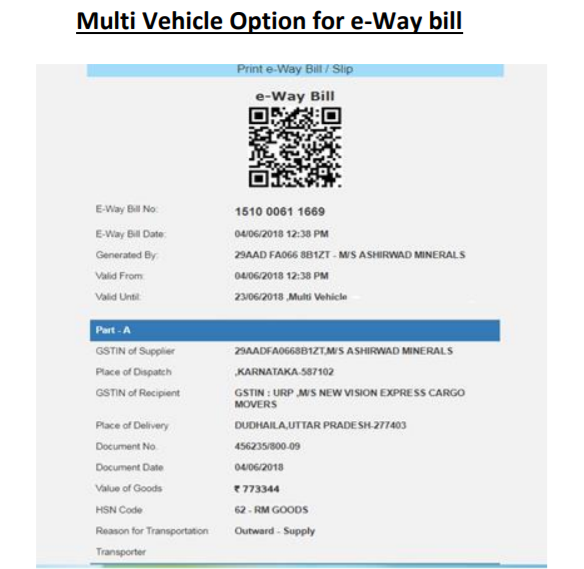 After the above details have been entered, the updated E-way bill with multi-vehicle details gets generated and the same can be printed for reference. It is important to ensure the validity of the E-way bill from the ‘Valid To’ section must be applicable for multiple vehicles as given in the image above. In case 1, part B will have vehicle details of lorry between West Bengal to Sikkim whereas, in case 2, part B will have vehicle details of 3 lorries to destination A, 2 lorries to destination B and 2 lorries to destination C.
Use ClearTax EWayBill to not just generate e-way bills quickly and accurately but also to take several actions on e-way bill like tracking the validity of e-way bills, rejecting e-way bills generated by others on your GSTIN, cancelling and managing all e-way bills at one place easily and minimal human efforts. 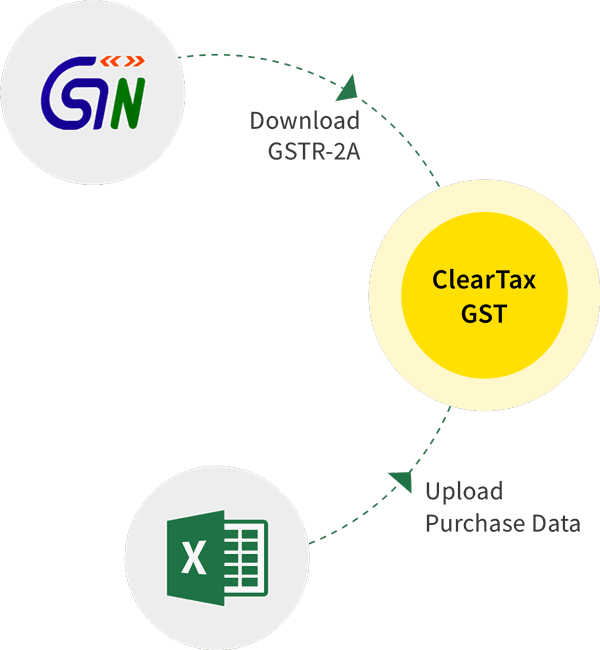 Our software also provides branch level- access control for Enterprises to manage e-way bills generated across India with a user-friendly activity dashboard.